After harvesting, the tobaccos are fire-cured in the traditional Kentucky method, then shipped to Saint James Parish, Louisiana where the tobaccos undergo barrel fermentation. However, instead of fermenting the tobaccos on pilóns as is traditionally done, their process uses car jacks to compress up to 500 pounds of tobacco into a 53-gallon barrels. After fermentation is complete, the tobaccos are shipped to La Gran Fabrica Drew Estate in Nicaragua. The smoke is medium-bodied and issues an appealing bourbon bouquet, making them ideal for pairing with your favorite bourbon, which brings out the pepper and smoke notes in the blend. Flavors of charred oak and leather, plus hints of vanilla and cinnamon make up the mix for a sweet and relaxing smoke unlike any other. A vitola from an old 1895 cigar salesman catalog. Very time consuming to make but very, very unique and ultra powerful – think LP No. 9 on steroids. Taste Profile: Lush, earthy and espresso-like with incredibly dense body. Cigar Style: An unparalleled smoking experience for the connoisseur. Honduran and Nicaraguan Cuban Seed Filler and a Brazilian Binder. Liga Privada No.9 cigars were originally created for the sole smoking pleasure of Drew Estate president Steve Saka. Exquisitely blended with 7 different tobaccos from 7 different farms, they’re handcrafted only by the factory’s top torcedors. Each cigar is flawless in construction, flavor and character. Rich, complex and full-bodied without being harsh, this Liga Privada (private blend) can be described in one word: AWESOME. Due to the high demand, these are becoming very rare, so order now. These new Liga Privada Flex Fit hats are a classy way to show your love for the Liga Privada cigar line. These are very similar in style to a New Era baseball cap. Structured, well fitting, clean design. Definitely a winner! Another fantastic cigar from Drew Estate, a manufacturer in Esteli, Nicaragua well-known for its flavor infused cigars. This Robusto is not flavored, and was in fact blended for the company’s president who favors rich, strong, oscuro wrapped sticks. Although initially a private blend, the cigar took off and is now sold to the public uncellophaned so that you can appreciate the beauty of its very dark, oily wrapper and the rich aroma of these sticks. Naturally sweet with hints of cocoa and coffee, medium to full bodied. This sampler comes in a wooden box and contains 5 Liga Privada No. 9 cigars in the following sizes: 2 Toro, 1 Double Corona, 1 Belicoso, and 1 Robusto. The Papas Fritas is part of Drew Estate’s Liga Privada Unico Serie, which features unique blends within the Liga Privada brand family. The Papas Fritas utilizes a Connecticut Broadleaf Maduro wrapper, Brazilian Mata Fina binder, and Nicaraguan and Honduran filler tobaccos. The small 4.5” x 44 cigar sports Drew Estate’s signature fantail and is the perfect choice for cigar smokers who are looking for a short escape. This Liga Privada T52 sampler contains the following cigars: 3 Toro, 1 Double Corona and 1 Robusto. These are so perfect in flavor and aroma. The Liga Privada Unico Feral Flying Pig are extra special, extremely limited and exceptionally delicious. The Feral Flying Pig is a strong cigar that will give your palate a kick. The Liga Privada Unico L40 Lancero is a limited production cigar by Drew Estate. made with Connecticut River Valley Stalk Cut and Cured Habano wrapper, Brazilian Mata Fina binder and Honduran and Nicaraguan fillers. It is a 40 ring gauge Lancero, instead of the traditional 38 ring, hence the name L40. The Liga Privada Único Serie UF-13 Dark is impressively rolled, covered in a dark espresso brown wrapper that is still slick with oil to the touch. It is a bit spongy when squeezed, but not overly so, and there is a very slight but noticeable box-press. Aroma from the wrapper is a combination of strong spices, dark chocolate, espresso, earth and barnyard. The fan cap is very well constructed, and really adds another layer to the physical look of the cigar. 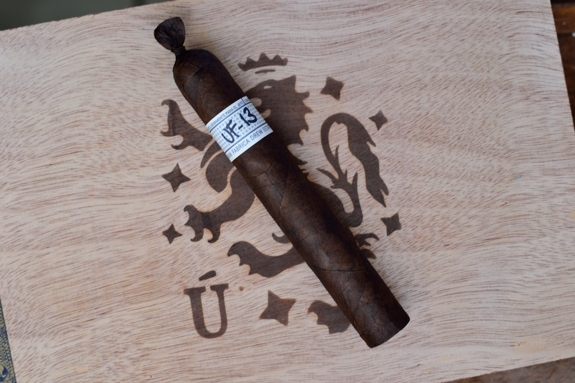 The UF13 starts out with immediate and extremely strong flavors of bakers spices, gritty earth, leather, espresso and dark chocolate. Each of the flavors are quite distinct, and there is a really nice black pepper note on the retrohale that helps the complexity of the profile quite a bit without being too overwhelming. There is almost no spice on the lips or tongue at all, but a wonderful vanilla sweetness starts to show itself after the first 15 puffs or so, contrasting well with the black pepper and earthiness that is already present. The Liga Privada Unico Serie Velvet Rat is 6 1/2 x 46, features a Connecticut Broadleaf “High” Mediums Wrapper, Plantation Grown Brazilian Mata Fina Binder, and fillers from Nicaragua and Honduras. It has been released in extremely limited runs to TESA Cigars, the 2015 Connecticut River Valley Barnsmoker Event, and as a Drew Diplomat Event Cigar. The cigar is difficult to make because of the fan tail cap. Production numbers were not disclosed, but the Velvet Rat will be available in 10 count boxes. Another great product from Drew Estate, has a creamy flavor due to the delay of the harvest of the leaves, leaving the smoker with a lush smooth smoke perfect for any cigar enthusist! Undercrown Shade cigars are completely dominating the cigar industry. This silky smooth beauty is the second release in the Undercrown line by Drew Estate, and unlike most movie sequels, this one lives up to this franchise’s legacy. The Shade is made with Dominican Criollo ’98 and Nicaraguan Corojo and Criollo longfillers, a Sumatran binder, and flavorful Ecuadorian Connecticut wrapper. The result is a medium bodied, full flavored smoke that is almost too good for words. Get your box today! Liga Privada Undercrown Sun Grown Corona Cigars are third to come out under the Undercrown line by Drew Estate. This one debuted at the 2017 IPCPR Trade Show. The blend of this cigar is a fruit of much thought on the parts of the blenders and rollers. It features a 15 years old sun grown Ecuadorian Sumatra wrapper leaf on top. Underneath this lies a blend of Nicaraguan long fillers including aged ligero leaves from Nueva Segovia region bound by a Connecticut River Valley stalk cut Habano binder that is cured and sun grown. The addition of ligero leaves imparts more strength to the blend. The smoke delivered by these premiums is outstanding to say the least. The body profile is medium-full. The Liga Privada Undercrown Sun Grown Corona Cigars are rolled in 5 5/8 x 46 and come in boxes of 25. Buy these cigars at the best online price at Cuenca Cigars. Liga Privada Undercrown Sun Grown Robusto Cigars are member of the third instalment of the Undercrown line by Drew Estate. This was introduced at the 2017 IPCPR Trade Show. This blend is created after lots of thoughts and attempts by the blenders and rollers. The final product comprises a 15 years old sun grown Ecuadorian Sumatra wrapper leaf overtop fillers blend from Nicaragua and aged ligero leaves from Nueva Segovia region. The binder used is a Connecticut River Valley stalk cut Habano binder that is cured and sun grown. The addition of ligero leaves imparts more strength to the blend. The smoke produced is medium-full with lots of flavours. The Liga Privada Undercrown Sun Grown Robusto Cigars are rolled in 5 x 54 and come in boxes of 25. Buy these cigars at the best online price at Cuenca Cigars. Features a dark chcolate dry, toothy wrapper with a firm even pack, minimal veins, tight invisible seams, and a sweet aroma. This is a mixed filler from the cuts of the Liga Privada line. Medium-full bodied pig tailed smoke.